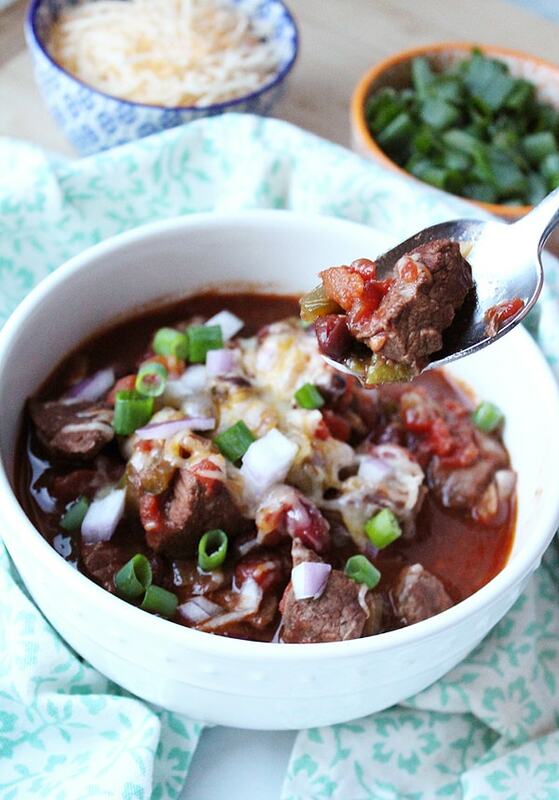 I use my slow cooker to make this because it's more energy efficient than using my stove. This isn't a magical "set it and forget it for 8 hours" recipe but it requires very minimal work from you - which is perfect for a day when you'll be home working on other stuff. Your soup can cook while you toodle around your house working on other projects. The end result is delicious homemade chicken soup in a rich broth you made from scratch. 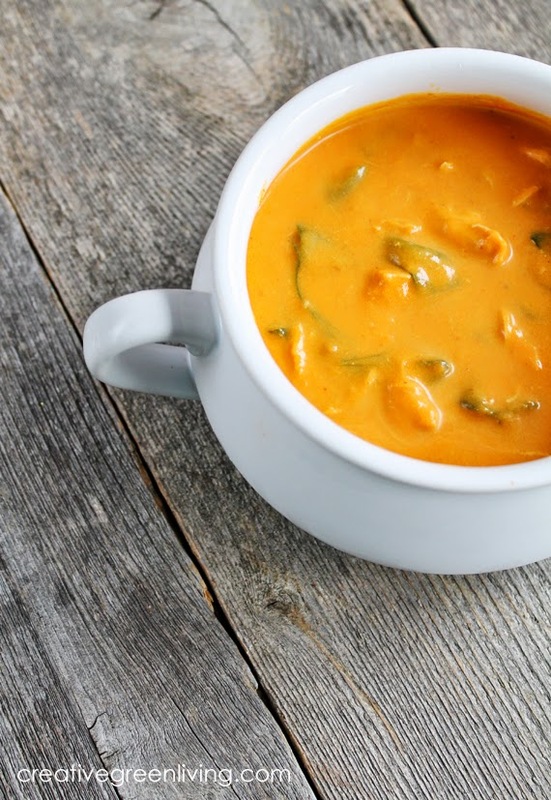 This soup is naturally gluten free, is keto friendly and perfect for those following paleo or Whole30 diet plans. 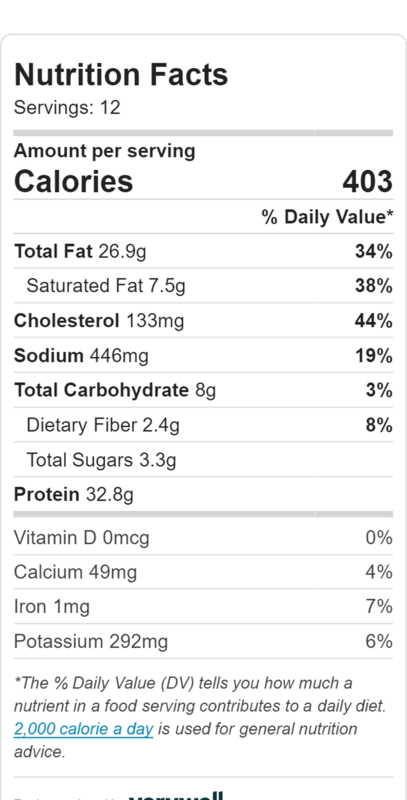 *I recommend purchasing these ingredients as organic where available to avoid GMOs, pervasive pesticides and questionable farming practices. To make the broth, add your whole chicken (include any giblets that came packed inside it - minus the bag) to your Crockpot along with the vinegar. Cut one of the onions into quarters and add to the crockpot. Cover chicken and onions with water, sprinkle with 1/4 tsp of sea salt and turn your slow cooker on high. After about 1 1/2 - 2 hours, your chicken should be cooked and tender. Remove the chicken from the pot and set on a cookie sheet to cool. Remove the onion quarters from the broth and discard. While your chicken is cooling, dice the remaining onion, slice your carrots into coins and chop your celery (I use a food processor for this part - it saves SO much time!). Add your cut veggies and spices to the broth in the slow cooker and stir. Once the chicken has cooled a bit, use a fork and a knife to pull the meat away from the bones and skin. The chicken should be very tender, making this very easy to do. Discard the bones and skin and add the chicken pieces back into the slow cooker. Don't worry about chopping or shredding the chicken yet - just add the pieces back to the pot as they are. Allow the soup to cook on high for 1 hour more or on low for 2 or more hours. Use 2 forks to shred the chicken (I don't even remove to chicken to do this - I just stab one fork into the soup until I find a large piece of chicken. Use the other fork to shred it in the bottom of the pot). Set the slow cooker to the "warm" setting until ready to serve. 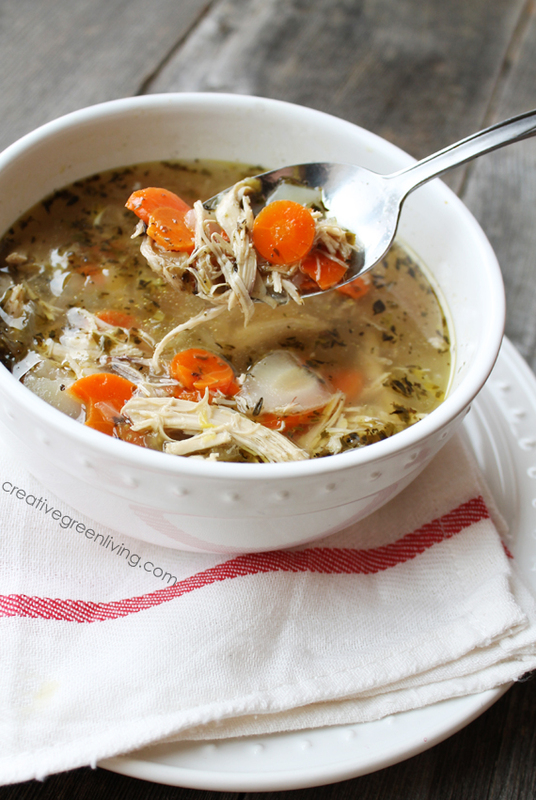 Learn how to make easy homemade chicken soup from scratch in your crockpot or slow cooker with a whole chicken. This healthy recipe is keto freindly, gluten free, paleo and Whole30 compliant. 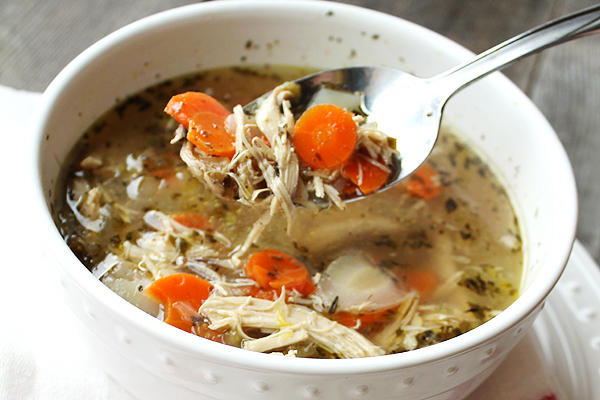 It's really the very best chicken soup recipe I have ever had and it's such a classic recipe to make for colds when someone in your family is sick. It also freezes beautifully so you always have chicken soup from scratch available. Cut one of the onions into quarters and add to the slow cooker. Cover chicken and onions with water, sprinkle with 1/4 tsp of sea salt and turn your slow cooker on high and cook for 1 1/2 - 2 hours or until chicken is tender. While your chicken is cooling, dice the remaining onion, slice your carrots into coins and chop your celery. Add your cut veggies and spices to the broth in the slow cooker and stir. Discard the bones and skin and add the chicken pieces back into the slow cooker. Don't worry about chopping or shredding the chicken yet - just add the pieces back to the pot as they are.